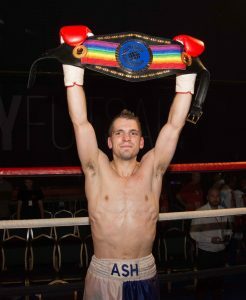 Bristol’s Ashley Lane captured the vacant Super-Bantamweight crown in an epic 12 round scrap with the experienced Preston based South African, Michael Ramabeletsa last Saturday at Play Football in Swindon. 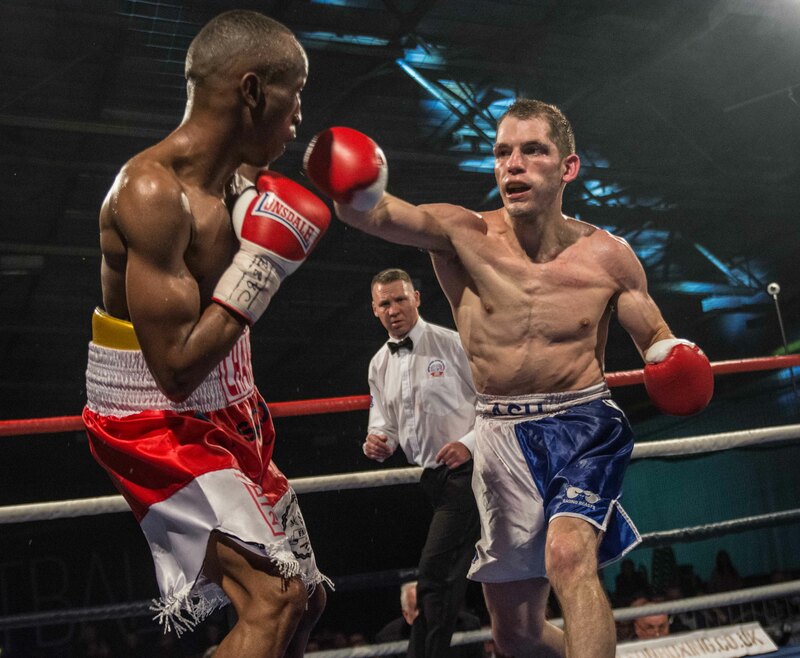 Referee Dave Parris scored the fight, 117-112, 116-112 and 116-115 in the Bristol fighter’s favour. 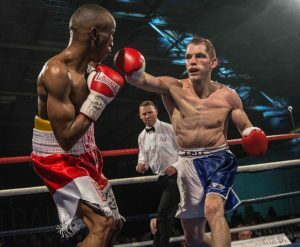 In a show jointly promoted by Mark and Tony Neilson in association with Jamie Sanigar, the main event was a thoroughly enjoyable toe-to-toe encounter, which would have been difficult to score, the majority of the rounds could have gone to either fighter. Both fighters showed that they were worthy contenders for the prestigious Commonwealth tile strap and at 26, Lane can hopefully secure some big domestic fights in the future. In the chief support role, Gloucester’s Akeem Ennis-Brown (Riiddy to his fans) made his normal extravagant entrance with his own MC, rapping his entrance theme as he made his way to ring. Fighting Birmingham’s durable and experienced Chris Truman, the current English Champion, was made to work throughout the six rounds after taking a couple of rounds to find his rhythm. After initially being drawn into a close fight as Truman closed down the range, Riiddy eventually settled into his rhythm and was given the fight 60-54 by referee Jeff Hinds. Bristol prospect Tim Cutler looked calm and settled as he faced Worcester’s tough journeyman Michael Mooney. Cutler refused to be drawn into the normal fiery exchange that is Mooney’s trademark by producing a neat and impressive performance. Mooney continued to be frustrated as Cutler controlled the action to the final bell with referee Jeff Hinds scoring this a 60-54 shutout. In only his third fight, Bristol fighter Aaron Sutton settled well into his first six-rounder with Brierley Hill’s MJ Hall. Both fighters were having only their third fight but it was Sutton, whose calm performance resulted in a 60-54 victory. 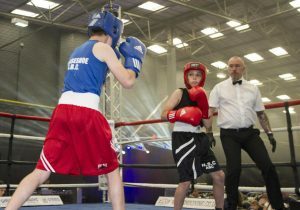 Opening the Pro-Am show earlier in the afternoon was a number of Swindon based Horseshoe Amateur Boxing Club fighters who were facing a team labelled London Select. First to box was Peter Stow boxing against Snodland ABC’s Freddie Loveridge. Loveridge being the bigger of the two, edge it although being pushed all the way. Peter Stow had his moments where he stood strong and exchanged bows but could not maintain the pressure. Swindon’s Horseshoe ABC boxer Karum Aujla, the current English champion at under 34 kg, faced Connor Henderson from Kettering ABC. He finished last year’s championship as runner up in the weight category above at 36kg so was set to be a cracking bout and it lived up to it . With Henderson being the more aggressive boxer applying pressure throughout the first round, Aujla slick movement and fast counter punching won him the first round. The second round Henderson was not so advancing, obviously under instructions from his coaches, inviting Aujla to come forward and thus taking him out of his stride .Aujla was not falling for it and boxed clever keeping out of trouble. Aujla won on a split decision. Jack Silks from Lymstone had real action packed bout against another Kettering opponent, Shane Tattersaully. Both 17 year olds demonstrated excellent boxing skills with the determination, and courage. They showed some great skill and exchange punches, battled for the three rounds with Silks winning the judges vote. Then we had big favourite local Jack Venton who faced Snodland ABC’s Ben Bishop. Venton and Bishop faced each other last season with Jack winning on a split. However, this time although a close well contested bout it was Jack that had the upper hand throughout the contest catching Bishop with either hand at will. Last up was Emerald ABC’s Kieser Singh v Michael Mulcahy. Mulcahy from Finchley ABC the much shorter stocky man put Singh under immense pressure from the first bell and halfway through the second round the corner throw the towel in to safe Singh from taking any more punches. Brian Roberts Horseshoe ABC’s Head Coach said “He said: “The occasion was brilliant, our boys rose to that and thoroughly enjoyed it. We have made plans already for the next one, and we hope to put on a bigger event. All involved agreed, they think it is fantastic and cannot wait for the next show.